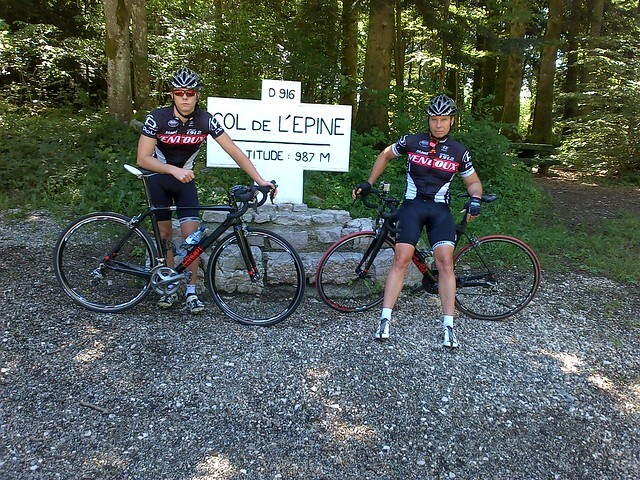 Father and son from South Africa seen here at the top of the Col de L’Epine. This is a new col to us here at PROMPT and not one that we have ridden before. The climb rises above Chambery to 987 metres above sea level over a distance of 8km with an average gradient of 7 percent. One for next year perhaps ? If you hired or bought a bike from us in 2013 we are after your photos. The more unusual the better. We will be choosing one photo at the end of December and that lucky person will receive one of our exclusive Alpe d’Huez Jersey. Simply attach your photo to an email and send it in to us.